mama elephant | design blog: MAMA ELEPHANT 3RD ANNIVERSARY STAMPEDE - DAY 3! MAMA ELEPHANT 3RD ANNIVERSARY STAMPEDE - DAY 3! 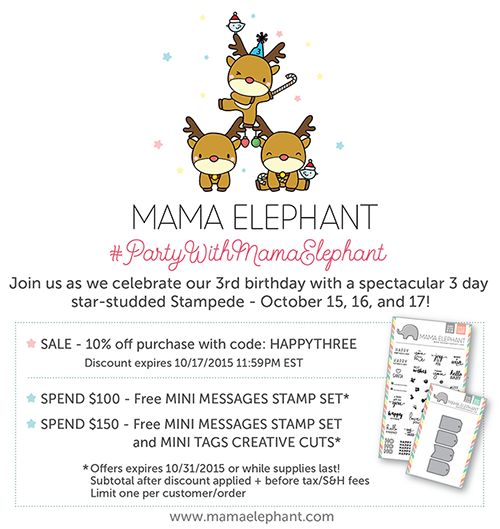 Welcome to Mama Elephant's 3rd Anniversary Stampede! The new release is live and available for purchase in the shop (www.mamaelephant.com) right now! I created this card using Twinkle Towns and a sentiment from Jingle Greetings. The dotted frame of the card is cut from the largest die from Pizazz Pieces. It certainly does a bit of a pizazz to the design, doesn't it? Twinkle Towns and some other new items are currently out of stock! We expect most restocks to start trickling in next week. We're also running behind on shipping because of the enormous response to this release! Please expect up to 7 days for orders to ship. We are doing the best we can and working overtime! Thank you so, so, so much for your tremendous support! Mama Elephant is also giving away three $25 gift certificates throughout all 3 days of the Stampede. To qualify to win, just leave a comment on this blog post! For more chances, complete each action below! Winners will be selected and announced right here on Monday, October 19th! We have invited so many amazing guest designers to join our Design Team for this special Stampede! Here is the list of designers for today, make sure you visit each one to check out what they'v done with the new release! And that would be a wrap! Big, big, big thanks to all our friends from days 1 to 3 for joining us! We could not have pulled off this epic 3-day stampede without you! And thank YOU all for joining us the last two weeks as you shared in our excitement for our 3rd year and this mega anniversary birthday release! As always, Angela and I are deeply humbled by your support through the years! We, Mama Elephants, will never forget! So gorgeous!! I love the concept of Twinkle Towns. So very cool! Wow, this is absolutely gorgeous! Loving the hop, too! Day 3 with fabulous designers and fabulous products by MamaElephant.. Thanks Mama Elephant for the chance to win! Not surprised that you are selling out fast - this release is so cute! Oh so super pretty! Selling out super fast for sure! Love this card, the whole release is fabulous! How lovely to have city/town scenes nestled inside the lovely ornaments! Your card is gorgeous! That card with the ornament is just gorgeous. I can't wait to get the reindeer I ordered. Gorgeous card! I love this set!! Love this release! Already ordered!! There are so many great images for card-makers in this release! Beautiful coloring, a awesome card from kryssi ! Oooh, love the city line image on the Christmas ornament. What an elegant card! I love the versatility of this set! Love your cute stamps! I am eagerly awaiting my order and can't wait to play with the new stamps! Yay! I can't wait to get my order. What a fun release! I love those pine branches -- love the look of them coming in from the side. I need these!!! Thanks for the stampede and giveaway! Beautiful release! This card is gorgeous! Oh my, Just finished watching all of them, amazing. Now to catch up with day 2! this is a great release! Beautiful catd! Love the latest release! Pretty card! All the cards are great inspiration. Can't wait to create my own. 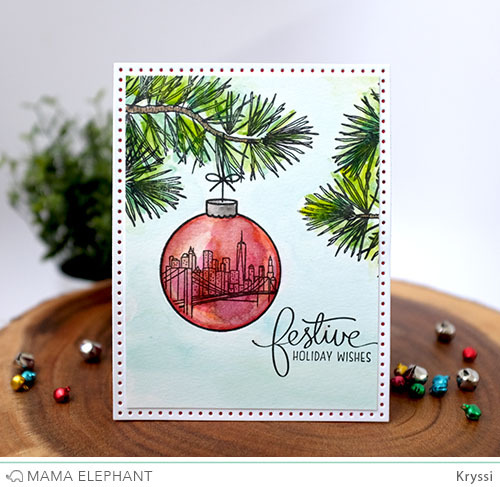 Love the watercoloring and the cute twinkle town in the ornament. Love the new releases. This card is awesome! I like how you added the cityscape to the ornament! Very clever! Lovely card! Love the new release! This is my fav stamp set from the new release! So elegant and fun to create. I've been a follower on Twitter! Really pretty card! I love this stamp set. Wish it wasn't out of stock, but glad to hear it will be back soon. Wonderful card, very elegant and festive. It's really a pleasure to see all the new goodies and what you created with them. I love that bauble! This release is amazing! Wow such a great card love it. Again a beautiful card, it just goes on! Love how the ornament looked 3D with how it is colored. Too bad, the freebie stuff and the coordinating Reindeer Games die are not in stock anymore. I would have ordered but I'm too slow. Amazing watercoloring! Your ornament is so pretty and the dimensional effect looks 3D. Love the ornament set in this release. Being able to put scenes inside is brilliant! Sure wish I had bought this stamp before it sold out :( Beautiful card. Pretty, pretty card! I feel all holiday-inspired! Yay! Love the new release and all of the projects are awesome! This card is lovely and I'm looking forward to seeing the rest of the blog hop. Congrats on the success of this new release. Beautiful card!! I love the ornament, very elegant. Another terrific batch of projects with lots of pointers picked up along the way! This is one of my favorite stamps from the release- great job! Thank you for all the great products and inspiration! You all are awesome! Can't wait to get my stash of goodies! What a fun line of products! It's hard to tell which one is my favorite, but I truly adore the card today! Great job! I loved the cards today except I did not get to see Sandys I could not figure out how to navigate her web site? I'm sure it was great though. I enjoyed all 3 days of wonderfully made cards by some awesome ladies, it will be hard to decide which items I want from this release. Twinkle Towns is a great set, I look forward to it coming back in stock! Another beautiful card! The past 3 days have been awesome seeing all of the creations! Happy 3rd Anniversary! So many gorgeous new sets - have loved all the inspiration over the past few days thank you! Beautiful card. Love the cityscape in the ornament. Another fabulous day of inspiration! I really can't wait to get my package now!! Beautiful card. Love the colouring of the pine branches. It's a must have stamp set for me. Very cute cityscape card. Christmas stamps are extra fun! Thank you for this Twinkle Towns set especially. It's fab. Gotta have it. Lovely watercolored image. Wonderful products in the new release, happy third birthday! What a great release... So many super cute stamp sets I can't decide!!! Fabulous release, super cute stamps that I must have!!! Sorry your anniversary celebration is over. Now on to year 4. The release is darling. So many cute stamps and dies. thanks for a wonderful 3 years of product. The card is so elegant! This release has so many fabulous products, too bad I can't get them all! This is a beautiful card, thanks for the inspiration. I like the scene on the ornament and how it hangs on the tree. Beautiful card. I enjoyed the blog hop. Loooove this Gorgeous Card and have enjoyed the Inspirational hop must do some more shopping after that not enough done the first time. Enjoy your Weekend! Such a lovely card! I'm a sucker for watercoloring, and yours is so beautifully done. I really do like the dotted border too. This new release is awesome! I love your card. I LIKE and shared the Stampede on fb! Pretty card. I shared and liked on fb. What a stunning card!! This release is fabulous!! I love, I need it all new stamps sets, there are amazing and the inspiration from the hop is so beautiful! While I have seen some of your wonderful products used by Jennifer McGuire and Nichol Magouirk, I am new to your blog. Because I saw the CUTEST video by Nichol where she made a desktop scene and told about the Blog Hop, I have officially "liked" you on FB and am looking forward to lots of great product ideas and design inspirations in the future! Thank you for bringing us such fun stamps and dies to play with!! I'm hoping to add to my collection soon!! Love this card, and I can see why this set sold out!! Congrats! I love the new stamp set, and the card is just adorable! Beautiful water coloring on your card! This new release is fabulous!!! LOVE this release! Gorgeous card! Great card and perfect for water coloring. What a fun release! Such a wonderful release and amazing projects by the DT! I think everything is wonderful! Very stylish card! It's really fantastic! I like and share ME on Facebook! I LOVE the Reindeer Games set! Very pretty card! Love the city scape ornament! I love this new release - Mama Elephant has the cutest darn creatures!! wow another gorgeous creations... love mama elephant thanks so much for another wonderful release!! Todays card is very beautiful. The love the city scape inside the Christmas ornament. I wasn't that excited about "another ornament", but the examples I've seen have just been so pretty. The whole release has been such fun with all of your great designers. Thanks so much. LOVE the DELICATE pine needles and GORGEOUS ornament with the scene inside - WOW!!! I love this release happy anniversary again!!! Kryssi, this is another fun release! I love your ornament card, it looks so life like! Enjoying the hop and all the inspiration! Beautiful card! These are pretty images and I love how the colors blend on the ornament. luv you new MME release - it's awesome! That is such a pretty card! Thank you for yet another AWESOME release!! I just completed the last day of the hop. Thanks for sharing this cute release, and for continuing to inspire us. Very cute. Nice release and TFS! Very nice card and love the release! Beautiful card. Love the water coloring. Fabulous card made! Love it! Loving the whole release! One of the prettiest stamps I've seen for the holidays! Very neat release. Love all the cards! I really like this card- the Twinkle Towns set is beautiful, I'm not surprised it's out of stock. Again, Happy Anniversary!!! I just placed my first order yesterday and can't wait for it to arrive. Congratulations on your anniversary and great products! Twinkle towns is a beautiful stamp set. I love the card and thanks for sharing the steps. Happy Anniversary! Love this stamp set. Lovely card. I don't do facebook or twitter. But I love mama elephant stamps. Such a cool new set! I love the loose watercoloring on your card. OMG I love love your cards it's beautiful. Love the city in the bulb. Love what the DT has shown! Gorgeous and so cheerful! Such an elegant card! Love the coloring! Happy Anniversary! Sweet holiday card. I adore the ornament, it's so versatile, and I love how you used it on this beautiful card! I am so excited for this release! I really love the idea of the twinkle town stamp set--you're going to have to come up with a ton of more "scenes" to go inside for future releases! Love this card. Great new release. I like on FB and shared. Wonderful card! I love the dotted border and the lovely watercolor! TFS! Gorgeous card -- love that set! Ok, well, I've loved all the new releases! !